Exploring Topics in Sports: Why Do Athletes Risk Using Performance Enhancing Drugs? It’s seen all too often these days: the meteoric rise of an athletic superstar, with fans that marvel at his strength, quickness and agility — and then, in an instant, the accusations of drug abuse and the subsequent investigations, probations, suspensions, and even permanent bans from the sport bring that rise to a screeching halt. For sports fans, it’s often an impossible thing to understand; why would a professional athlete with millions of dollars on the line risk using performance-enhancing drugs (PEDs)? The upside of PED use, especially in the short term, could literally be a multi-million dollar windfall, whether it’s making a roster, or signing a huge contract. As Jose Canseco said, “I don’t recommend steroids for everyone…but for certain individuals, I truly believe, because I’ve experimented with it for so many years, that it can make an average athlete a super athlete. It can make a super athlete incredible.” Ultimately, for certain athletes using performance enhancing drugs is a calculated risk. But to come to terms with a risk, athletes need to evaluate not only the upside and the downside, but also their probability of being caught. It begs the question — are athletes who use PEDs slackers looking for an easy edge that can lead to extra money, or, are they simply rational gamblers? How Prevalent is Drug Use in Sports? In 2005, Major League Baseball introduced a new, stricter drug policy that significantly increased the severity of penalties for steroid and amphetamine use, signaling the end of the so-called “steroid era.” In order to accurately judge the prevalence of drug use in sports, the graphics below use this new policy as a benchmark date and summarizes ten years’ worth of suspension data across the National Football League and Major League Baseball, which have much higher incidence rates than any other sports. In Major League Baseball, 47 players have been suspended for using banned substances (including steroids, HGH, testosterone, and amphetamines) since 2005, with penalties ranging from ten-day suspensions to 162 games (or the entire regular season) in the case of famed infielder Alex Rodriguez. Of the 47 suspensions, 12 were for a mere ten days, while 19 were for 50 games; only three were for 100 games or more. Notice that roughly half of these suspensions are attributed to “undisclosed” substances. Under Section 5.C of the MLB’s drug policy, the Commissioner’s Office may issue a statement announcing the suspension of a player that includes the length of the suspension and the specific substances(s) and the category of prohibited substance that the player tested positive for or used, possessed, sold, or distributed. For first offenses, the Commissioner’s Office often keeps the substance involved undisclosed, putting the onus on the player to withhold or share that information with fans. 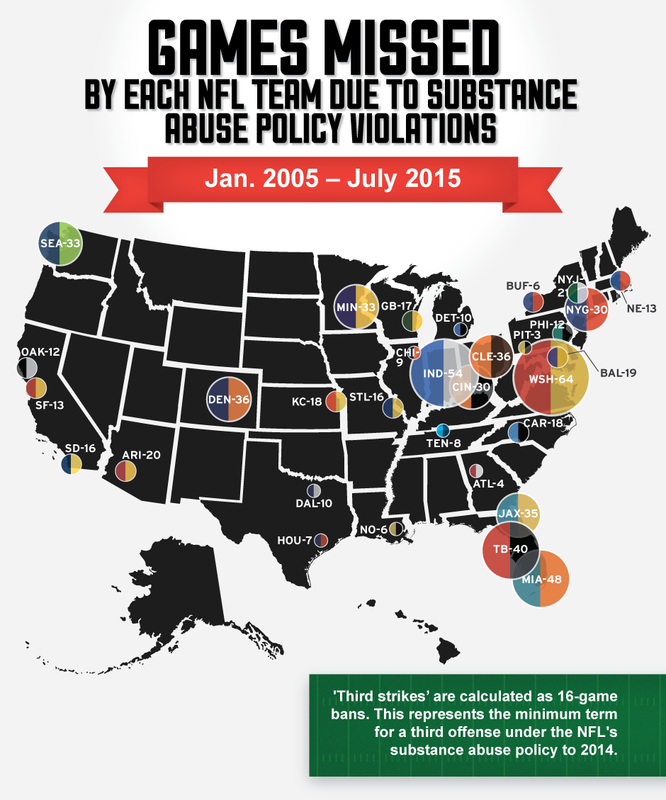 Meanwhile, in the NFL, teams vary widely in the amount of drug-related suspensions enforced by the team. By comparison, only 3 games have been missed by Pittsburgh Steelers players due to suspension, while the Indianapolis Colts dwarf that number with 54 games missed. Suspensions related to substance abuse saw a sharp uptick in the NFL beginning in 2012, jumping to 82 suspensions in 2012 from 21 suspensions in 2011. Note that, in the map below, ‘third strikes’ are calculated as 16-game bans. This represents the minimum term for a third offense under the NFL’s old policy, which was replaced in 2014. While undisclosed substances make up the vast majority of violations, it’s interesting to note that alcohol and marijuana are not far behind when it comes to substance abuse suspensions. However, alcohol-related suspensions are on the decline since 2006, while marijuana-related suspensions have remained fairly constant over the last ten years. Drug-related suspensions, performance enhancing or otherwise, have become commonplace throughout the past ten years. But what physical advantages make the risk of suspension so tempting to athletes? Simply put, many of the drugs athletes take illegally are designed to increase their athletic performance. Marijuana provides an interesting case for the leagues. The leagues tend to treat marijuana as a recreational drug; athletes, however, have cited it as a substance that helps with recovery and pain management. With the athletes’ perspectives in mind, marijuana is grouped with amphetamines, anabolic agents, and other PEDs in the graphic below. However, steroids and its related hormones have visible side effects, especially when taken at higher than medically safe doses. Men may experience prominent breasts, baldness, shrunken testicles, infertility, and impotence, as well as acne, an increased risk of tendinitis, liver abnormalities, high blood pressure, aggressive behaviors, psychiatric disorders, and more. To combat these side effects of anabolic steroid use, many athletes turn to anti-estrogens, which mask many of the telltale signs of steroid use. Anti-estrogens block the body’s estrogen receptors, allowing athletes to protect their physique while engaging in steroid use. One murky area of today’s drug landscape concerns Adderall and related drugs. Adderall is typically prescribed for ADHD and other related conditions as a way to help the patient focus, remain calm, and maintain concentration. However, studies have shown that Adderall and related drugs can help improve hand-eye coordination, acceleration, and strength, which athletes could benefit from in addition to improved focus and concentration. While the goals of taking drugs — improving performance or recovery time — are largely the same across sports, the policies of major sports all vary considerably regarding their testing methods and penalties. The NFL’s drug policy differs from the MLB’s, which differs from the NBA’s, and so on, although the leagues’ different drug policies do have some common elements. For the major sporting leagues in the United States, the drug policy is generally determined by the league and negotiated during collective bargaining (the NCAA, interestingly, relies principally on the testing programs at their affiliated institutions, which vary widely; however, the NCAA typically makes several visits throughout the year to ensure policies are being upheld). Here’s a glimpse at how drug policies stack up across major sports. The NFL and MLB also test for “drugs of abuse” (recreational drugs, i.e., marijuana, cocaine, etc) and the NBA, similarly, tests for cocaine, opiates, PCP, LSD and marijuana. Prior to entering the league, only the NFL requires pre-employment testing for all players, although in the MLB, all players are subjected to testing within five days of reporting for spring training. The NBA, NHL, NCAA, and all other professional leagues do not require pre-employment testing. The frequency with which players are tested also varies greatly among professional leagues. In the NFL, all players are tested at least once per year, and the policy allows for targeted testing. Ten players per team are randomly tested each week, which continues during the playoffs for teams in the postseason. There may also be up to six offseason tests per player. In the NBA, all players are subject to four random tests per season, and the league conducts reasonable-cause testing. Similarly, in the NFL, players are tested up to three times per year at random. Surprisingly, in the MLB, players are only subject to the test within five days of reporting for spring training and one other test on a randomly selected date, in addition to random tests in and out of season. If a player in any professional sport violates the league’s drug policy, they are immediately suspended, and the length of suspension (or ban) depends on how many times the player has violated the drug policy. In the NFL, a first violation leads to a minimum four-game suspension, while a third violation calls for a minimum 12-month suspension as well as disqualification from the Pro Bowl and other honors for the year. In the NBA, the first positive result for PEDs earns a 10-game suspension; the fourth violation results in disqualification from the league. If a first-year player tests positive for drugs of abuse, he earns a one year suspension with a chance of reinstatement after one year; all other players are suspended for at least two years. However, as we’ll discuss more below, players who come forward with a drug abuse problem receive league-paid treatment. In the MLB, which strengthened its drug penalties in 2005, a player’s first PED violation leads to a 50 game suspension without pay. A second violation leads to a 100 game suspension without pay, and a third violation leads to a lifetime ban. However, violations of drugs of abuse are treated clinically first, rather than through suspension. 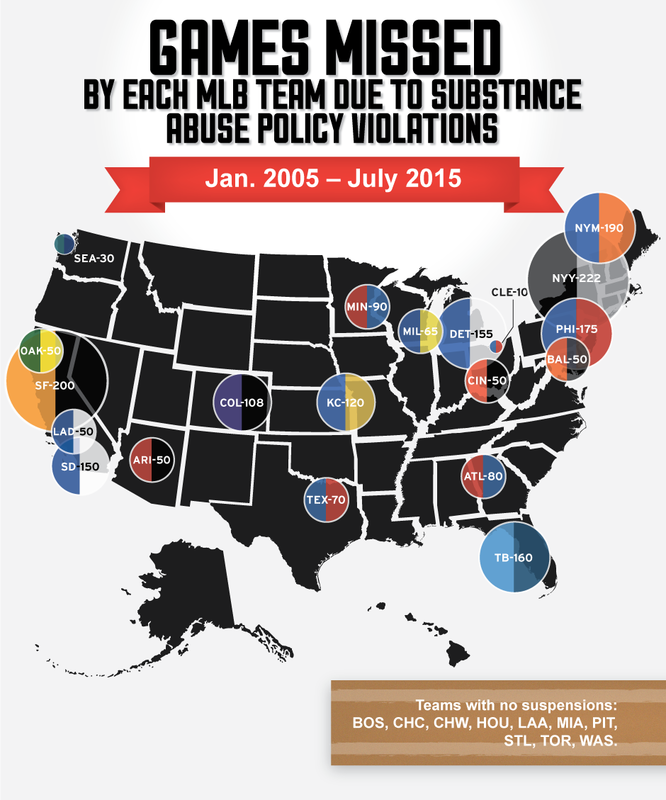 The professional leagues’ approaches to their substance abuse programs vary as well. In the NFL, upon testing positive for a banned PED, the player is notified and the sample (which is split in half during the original phase of testing) is re-tested. Mandatory physical examinations are conducted to rule out naturally occurring high levels of chemicals (such as testosterone), and psychological examinations may also be conducted in case of suspected addition. The burden of proof is placed on the league during an appeals process. In the NBA, meanwhile, the approach is much more recovery-focused. Players who come forward with their drug problems receive league-funded counseling from the Life Extension Institute, a 24-hour counseling center funded jointly by the NBA and the NBPA. The MLB’s approach takes a middle ground. 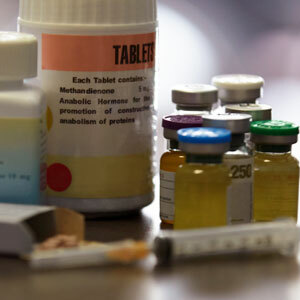 Any player testing positive for a drug of abuse or found to possess such a drug must submit to an initial evaluation by medical personnel, who then determine whether or not a treatment program is necessary. The treatment program is agreed upon by medical personnel and the player, who can complete treatment as either an inpatient or an outpatient. Players who refuse to comply with the treatment program or who test positive for drugs of abuse after their evaluation and commitment to the treatment board may find themselves suspended or subject to other discipline. Out of the major professional sports, the MLB has perhaps the most interesting history of drug policies. In January of 2005, under pressure from Congress, the MLB and its players announced a new drug agreement, in which first offenses earned a 10-day suspension and fourth violations earned a one-year ban. However, later that year, players and owners revised that agreement to say that first violations resulted in a 50-game suspension, second violations resulted in 100-game bans, and third violations earned lifetime bans. In 2011, players and owners agreed to have blood testing for HGH during spring training in 2012, and blood testing has since been implemented during the regular season. In March of 2014, players and owners announced that PED penalties would increase to 80 games for a first violation and 162 games (or a full season, including the postseason) for a second violation; all suspensions are without pay. In 2007, the NFL announced stricter anti-doping policies, increasing the number of players tested and the number of random off-season tests; four years later, the NFL became the first major American sports league to approve blood testing for HGH, a policy which was finally implemented in 2014. The NBA’s drug policy has remained relatively constant over the years. The NHL first instituted a drug-testing policy for PEDs in 2005. What causes an athlete to assume the risk of taking drugs? For an NBA player, maybe it’s knowing that he can always come clean, so to speak, and get free treatment. For an NFL wide receiver, maybe it’s the possibility that an easily obtained Adderall prescription could improve his reflexes. For an MLB player, maybe it’s the fact that random tests are few and far between. Whatever the case, it’s clear that positive drug tests are much more prevalent in today’s sports than they were even ten years ago. Many sports fans tend to take the black-and-white view of athletes and PEDs: professional athletes who take PEDs are labeled as poor decision makers, while athletes who reject PEDs are supporting the purity of the sport. However, athletes and PEDs actually lie more in a grey area. Given the profound effects that PEDs can have on your body, and the fact that marginal improvements in performance can be rewarded with multi-million dollar contracts, professional athletes who take PEDs might be more accurately labeled as calculated risk-takers — especially if their sport’s drug testing policies are lax. It’s easy to ask (and answer) the question of why so many athletes get caught using PEDs. Instead, maybe we should begin asking ourselves — why so few?